This was a historic experiment—to the best of our knowledge, it was the first time that American high school students had used a process called participatory budgeting that we, as scholars of participatory democracy, have studied. But the Bioscience budgeting was more than history—it was an answer to the broader problem of participation. Americans are often told to participate in local democratic decision-making, but we are rarely told how. And so most of us don’t know how. To counter this trend, some educational institutions have begun trying to reach democracy through democratic processes. Bioscience is an interesting case. It is a STEM (science, technology, engineering, and math) public high school with approximately 300 students of diverse socioeconomic backgrounds. The student population is more than 60 percent Latino, and roughly two-thirds of students qualify for the free and reduced meals program. Bioscience teachers emphasize project-based, student-centered learning through exploration and inquiry. In the U.S., the first participatory budgeting process took place in Chicago in 2009. PB has since been used in New York; Greensboro, N.C.; San Francisco; Long Beach; Boston; and post-bankruptcy Vallejo, California. Although each process is different, participatory budgeting tends to follow a similar structure. In the first phase, residents identify local needs, brainstorm potential ideas to address these needs, and elect delegates to represent individual communities in deliberations. In the second phase, delegates discuss their communities’ priorities and formulate project proposals. Then, delegates bring these proposals to the community for a vote. The most popular projects are funded and implemented, and the process begins in the next year or budget cycle. The three projects that received the most votes were educational in nature. The first was a sustainability education display for the school’s courtyard, the second was color ink for a student-built 3-D printer, and the third funded camera adapters for laboratory microscopes. The three most popular projects exceeded the PB budget by a few hundred dollars, but Principal Boyce was so enthusiastic about the way the process unfolded that he agreed to fund all three options. Reflecting on the experience, he told us he felt honored to provide an opportunity for students to participate in the improvement of the school community, and he hopes this experience will inspire students to engage in—and change—their communities. At the end of that school year, Dr. Boyce was transferred to another school, and there was some concern that the incoming principal would cancel the experiment. But incoming principal DeeDee Falls decided to continue the process. The second cycle of participatory budgeting is currently underway. 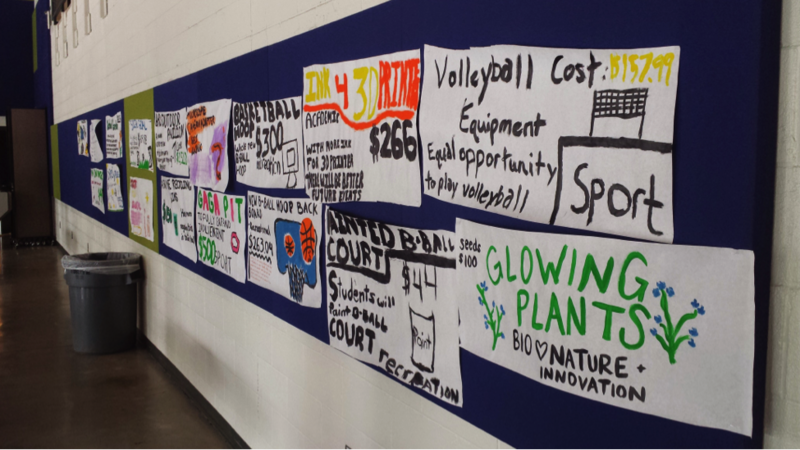 At this early stage, students are brainstorming ideas like soccer goals, a bike share program, and an aquaponic system and an algae reactor to produce biofuel. Principal Falls told us that this process makes sense for a school like Bioscience that tries to involve students in many aspects of their educational process. For her, participatory budgeting is valuable because it encourages students to collaborate with their peers and make meaningful decisions, together. *Photo courtesy of Matt Cohen and Daniel Schugurensky.